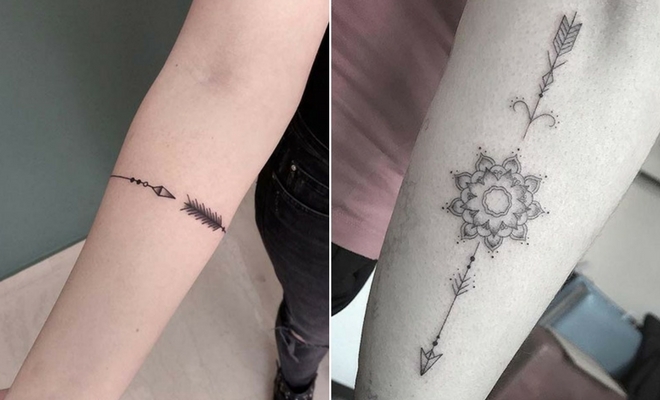 Arrow tattoos are simple and stylish, so it is easy to see why these have become so popular. 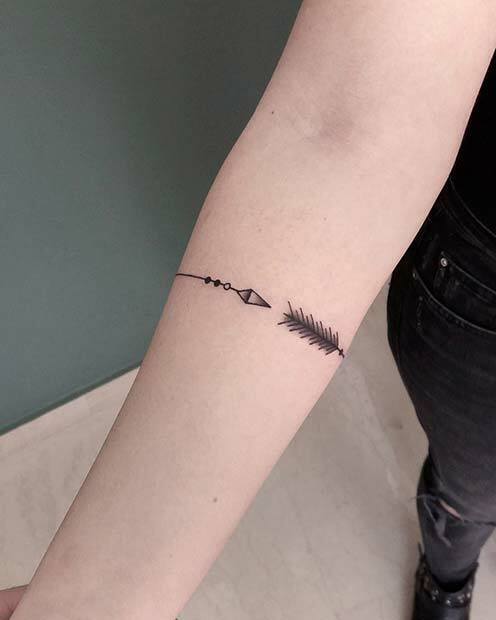 An arrow has many different meanings some of which include positivity and moving forward, love and an arrow can also be a symbol of protection. Of course, you can get an arrow design just because you like it! 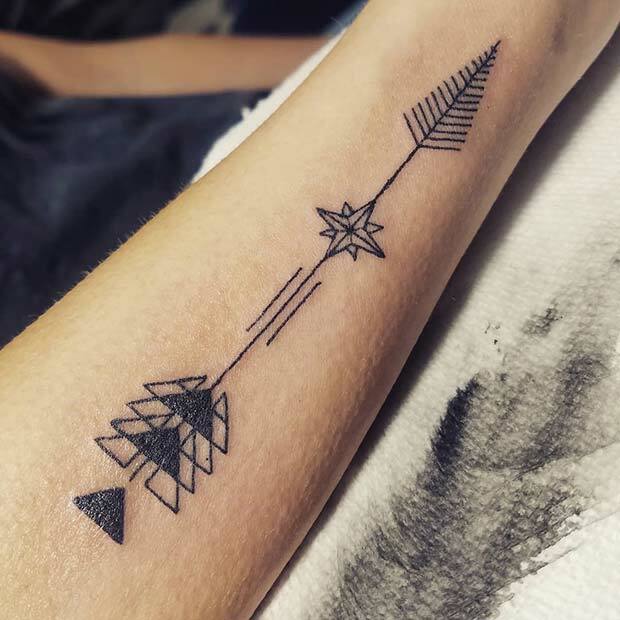 To show you how cool these tattoos can be we have found 43 trendy arrow tattoo ideas. There is a design for everyone from subtle to bold and colorful. First on our list is this forearm band tattoo. The arrow has been designed so it wraps around the arm and the two ends meet. Forearm tattoos are very trendy and almost act as a piece of jewelry. We love this design as the arrow is simple but stylish. You could add color to the arrow if you wanted a bolder look. Our next tattoo idea features intricate dot work. Dot work tattoos have become very popular and the finished result is beautiful. 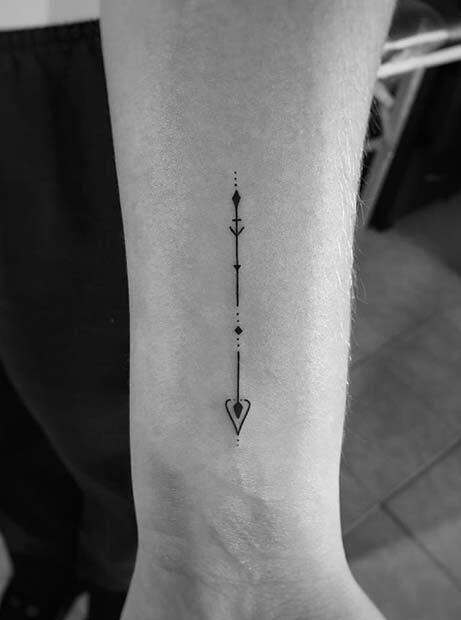 The arrow itself has a cool design and something like this is perfect for anyone who wants a creative and unique tattoo. You don’t just have to choose a single arrow. You could make the arrow part of a larger design like this map tattoo. 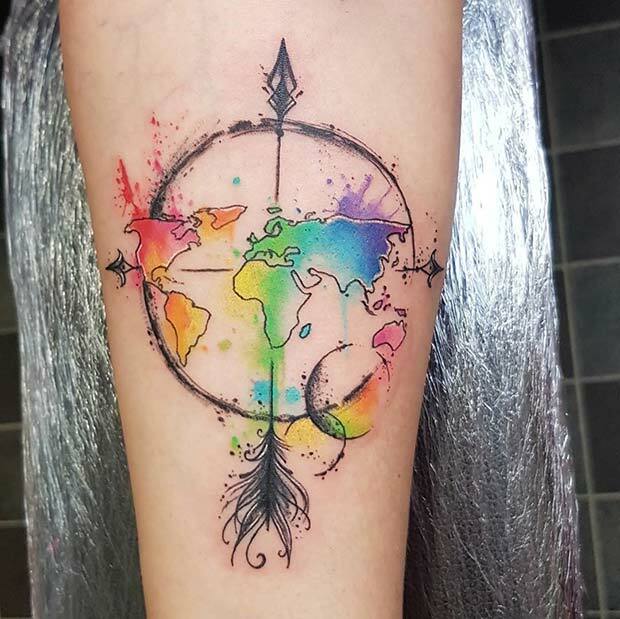 A world map and arrow tattoo like this is a great choice for anyone who loves to travel. You could have your design with lots of color like this or maybe with one or two for a subtler look. Next, we have an idea that combines two very popular designs. 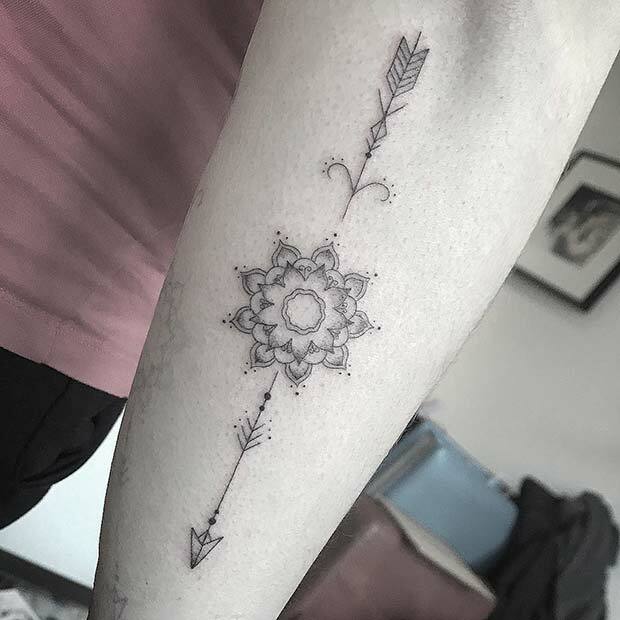 The tattoo features an arrow and a mandala. Mandalas have beautiful and intricate patterns and the style works so well with an arrow. A design like this is perfect for anyone who wants a stylish and delicate tattoo. Many choose to have their tattoos personalized with names, initials or dates. This next idea shows one pink arrow and a blue arrow. Each is personalized with a name and date. A design like this is perfect for someone who wants a tattoo with their children’s names. You could also have a similar design and use any name and date, maybe a loved one or friend. If you want a subtler tattoo, then this idea could be for you. 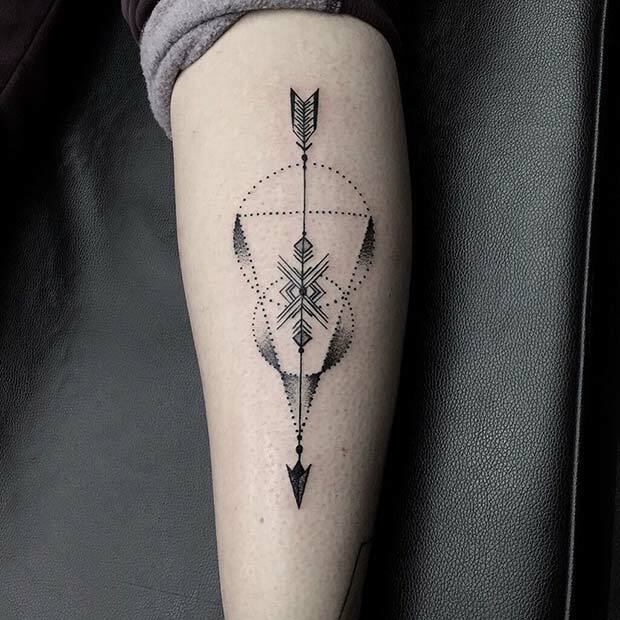 The arrow is black ink and has a simple design. A tattoo like this will suit anyone, it would also be a great first tattoo as it is quite small. You could have this placed almost anywhere on the body, maybe consider the foot, arm or leg. 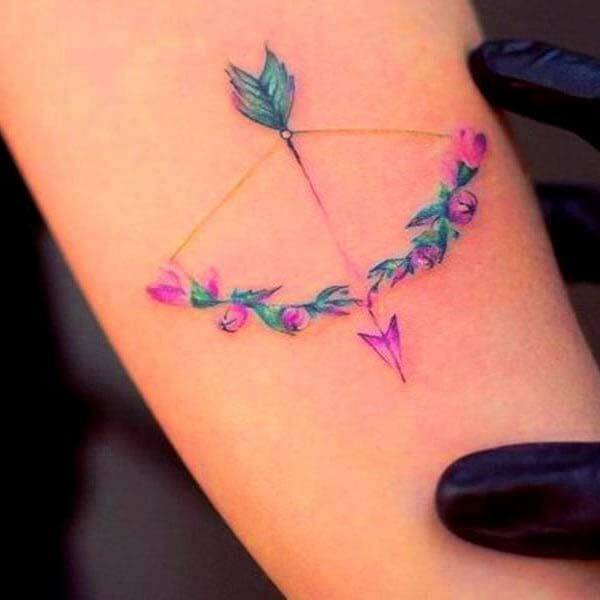 Our next idea is this pretty, floral bow and arrow tattoo. It is very feminine and delicate due to the light flower design. This tattoo has a romantic look, so it would be great as a symbol of love. 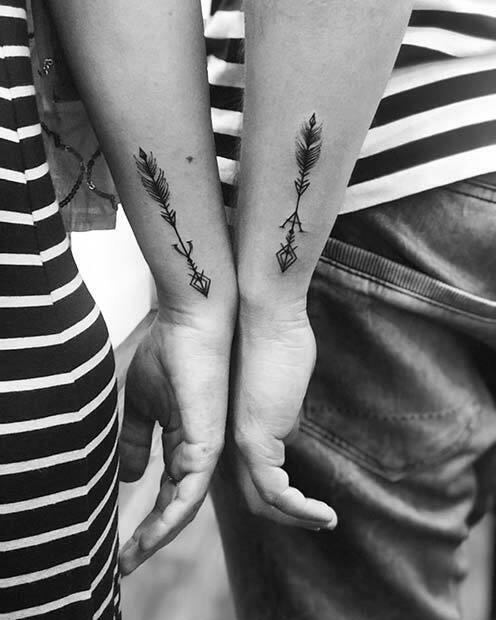 You could have a similar tattoo created but you could use your favourite flowers instead. Next, we have a stylish tattoo idea. 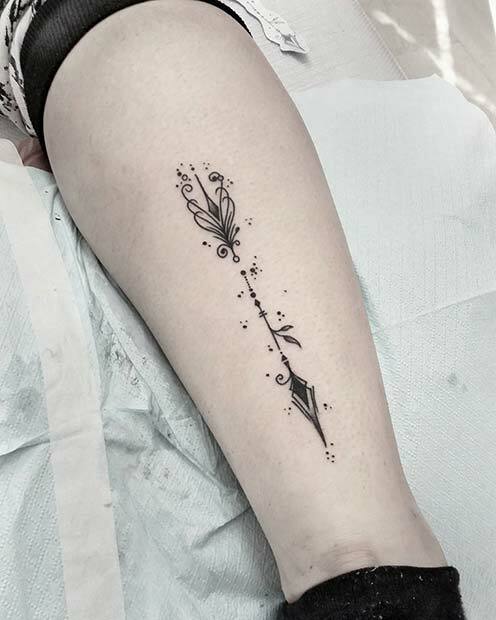 The arrow has been inked onto the leg and features beautiful swirls and dots. We love the design of the arrow, it would suit everyone and can be placed anywhere. You could also have a similar design created but try it smaller, you could maybe even add some color. Matching tattoos have become very popular. This couple have chosen a matching arrow design. 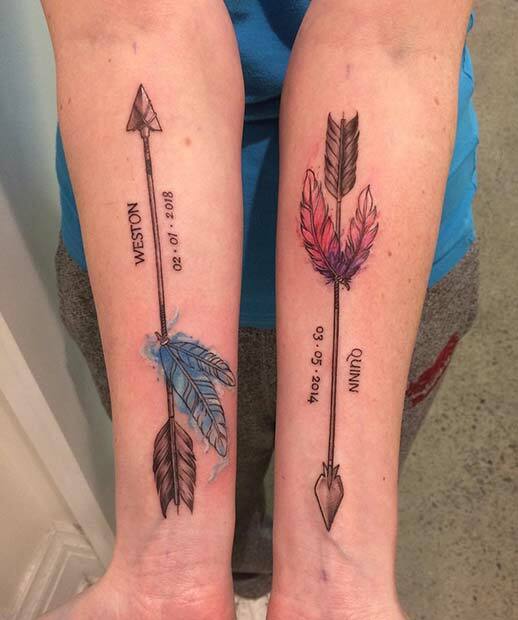 They both have the same arrow tattooed on their arms and there is also each other’s initial to. You could a tattoo like this created with your other half, friend or family member. We love this cute and trendy idea! Arrows can be designed in so many ways, one which a lot of people seem too choose is an arrow with a geometric design. This arrow uses a triangular pattern. Geometric patterns like these suit arrows so well. You can have a similar tattoo or be creative and choose your own unique look.